Don’t want cash or travellers’ cheques? Grab a prepaid card and load cash onto it before you go to give you complete control over your spending while you’re away. 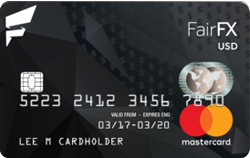 The FAIRFX Currency Card is a prepaid MasterCard® Card that has great rates. Use our special link to get your card for free – there’s usually a £9.95 application fee if you load less than £200. You get FairFX’s own exchange rate, which changes daily but usually beats that of most other prepaid cards. FairFX is FCA regulated so your money is safe.